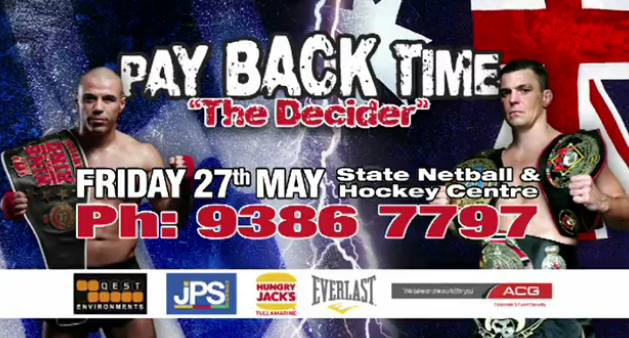 Get ready Australia for the biggest fight to hit Melbourne!! 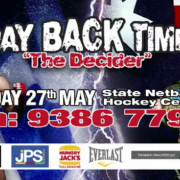 Powerplay Promotions Presents PAY BACK TIME “THE DECIDER” MAY 27th JOHN WAYNE PARR Vs MIKE ZAMBIDIS.This is JWP’s last fight in Melbourne before he retires. Will JWP go out on a high or will ZAMBIDIS seek REVENGE. Last time these 2 met it was in front of 4,000 spectators. Good luck JWP. I’ve been following your fights for a while and think you are one awesome dude! Can’t wait to move to the GC and come to your gym to train if that’s okay. Angie’s fight was crazy we won the 1st, lost the 2nd, won the 3rd, lost the 4th, its now or never Angie, need this last round to win, 3 minutes. I lost last night. It was like a race and I lost the sprint. She is a much better boxer and knows how to throw a lot of punches and moves well. What a fight, that was one of the hardest fights I have had in years. Dimitr bought the craziest style with spinning kicks and elbows and they would come out of no where. Bloody amazing effort. Thor stuck and moved and didn’t let Paul tee off on him. Thor cut Paul in the 3rd but kept calm not doing anything to get him in any danger. What a great fight by both girls. Was so worthy at a world title and just a shame it wasn’t on one of the bigger shows so it could have got the foxsport exposer, had more action then most of my fights.